Want to know how Manjaro stacks up against the other "unknown" distros of 2013? Click here to find out! This review is conducted using a live CD version of the Manjaro 0.8.7 Linux distro via a VirtualBox on my MacBook Pro. The MacBook has a 2.5GHZ Intel Core i5 and 4GB of RAM, of which 1GB was allocated to the distro via VirtualBox. Manjaro is based on Arch and comes with either Openbox or Xfce desktop environments. I downloaded the 64 bit version of the Xfce version for testing. I won't be covering how to install it via VirtualBox, but you can read how to do that by going HERE. Arch is for a more advanced user of Linux, so it is not for the novice user or someone who wants a user-friendly system. What Manjaro hopes to do is bridge the gap between user-friendly Linux distros like Ubuntu and experienced-user distros like Arch. My personal opinion is that it accomplishes this feat fairly well. Unlike some of the beatings I've dished out on distros in the past on this blog, I really don't have a lot of negative things to say about the distro. It uses slightly more resources than I would normally want it to, but I have resources to spare, and it is a very good-looking OS. My inexperience with the Xfce desktop is no different than my previous inexperience with Apple's OSX. I grew to understand it and a new user can learn to understand Manjaro. As I write from an end-user perspective, I found that Manjaro presents a good case to become your distro of choice. 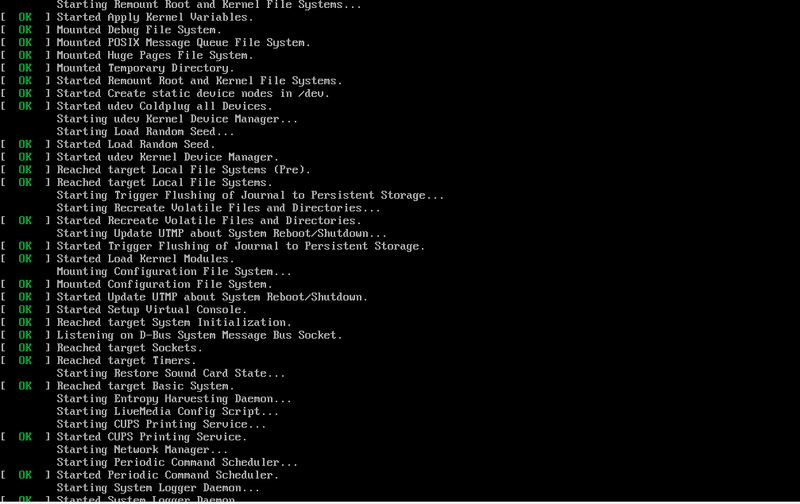 One of the interesting things about Manjaro is that you see all of the scripts running as it boots up. Many modern distros have gotten away from that in order to provide a smoother user experience and while I can understand that from a user perspective, it's also nice to see the older screen sometimes. I can know that way that the system is working instead of just hoping it boots up (I usually work with decrepit computers!). This may cause an issue with novice users, but probably not for those with any experience at all with Linux. The developers have a user guide on the desktop when you first boot the live CD. I want to go on record as saying that this user guide isn't very good. It includes the usual fodder such as why you should choose Linux, but no real information. This would have been better placed into a wiki like most other distros. Ironically, they have a full-functioning wiki that provides all of the necessary information. At rest, the OS uses 3% of my CPU resources but actually uses a whopping 45% of my memory (1GB allocated from the MacBook's 4GB). This does add some concern as it wouldn't be very usable for a computer user with limited resources. On the other hand, I was using the 64bit version, so perhaps the assumption is that the user will have a substantial amount of RAM. 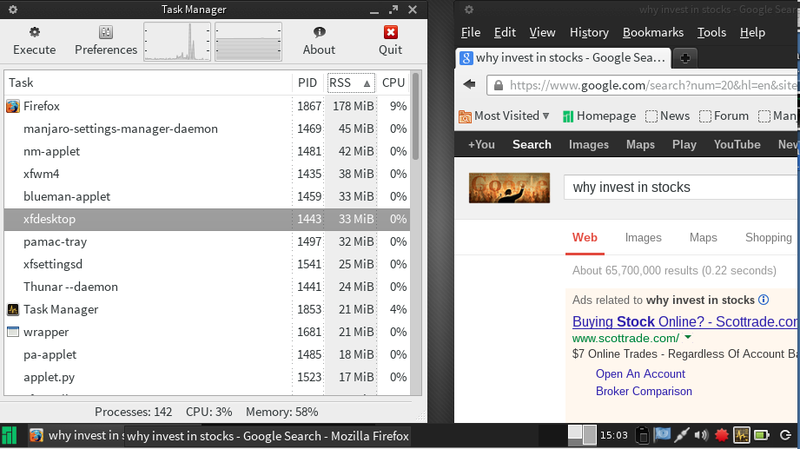 While running a search on investing (pictured below), my CPU usage jumped to 50% or so and RAM demand bumped to 59%. Considering that the RAM use was already at 45%, this wasn't all that much of a jump. It certainly handled Firefox well. 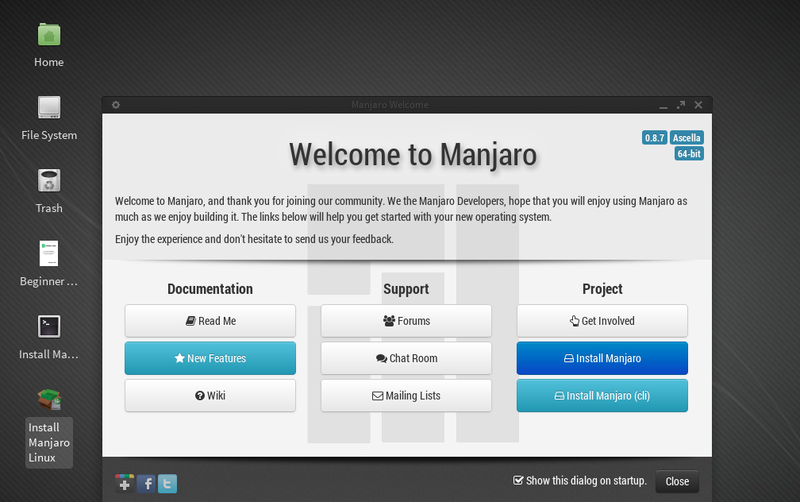 The basic load-out of Manjaro includes the usual LibreOffice suite version 4.0.5.2. While some distros opt for the Google Chrome browser, Manjaro sticks with Firefox for browsing and Thunderbird for email. The live CD doesn’t come with games per se, but it does come with Steam, so by logging in and buying a version for your Linux box, you could have whatever game they offer to your liking. Other than that it comes with a pretty standard set of programs. I realize that I got a little negative above when dealing with the wiki and how much RAM it uses, but the fact is that I really enjoyed testing this distro. It's clean, comes without a lot of the junk that bogs down other distros, and works great. One of the things I found most striking about Manjaro Linux is that it utilizes a rolling release development model. That means that you theoretically won't have to download a new version of the distro like you do with Mint, or perform a significant update like you do with Ubuntu. I honestly don't know how this will work out over time, but I'll keep my eye on it as it is an impressive concept. I don't know if they really achieved the goal of creating a completely user-friendly Arch distro. If you're a new Linux user, or not very experienced, then you'll probably not find it completely agreeable. However, if you want a pretty and useable distro, then give it a try. I've been using Manjaro since 0.8.1 and it's still one of, if not my most favorite distro. There have been some problems in the past but with each subsequent release it just keeps getting better. It also has one of the best linux communities around. The people on the forums are very friendly and helpful. I've been using Manjaro since 0.81 and even though I have strayed temporarily to test other distros I always come back to this one. There have been some problems in the past but with each subsequent release it just keeps getting better. Thank you for your comment. They have made a very pretty OS that works very well. Crabdog. Thank you as well. I'm pleased to hear from someone who has been using Manjaro for some time as it shows that they have a good following. If I were any more experienced in Arch than I am, which is admittedly not much, then I'd probably appreciate it more. As it is, I'm still very impressed and plan to follow its future developments. One question I have is how has the rolling release worked for you? Does it update easily? How different is it from the version I reviewed? Nice blog, but as far as Manjaro goes, you've totally missed the boat so to speak. Running it in a VM doesn't even begin to scratch the surface of what they've got going on. First off you've got the option to use proprietary drivers at install or you can choose to use the FOSS drivers. Second, unlike Arch, your kernel is not tied to updating your system. 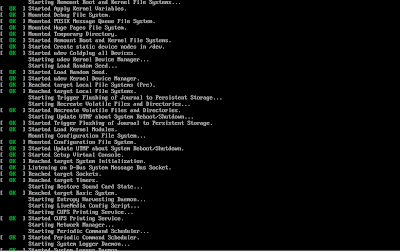 To update your kernel means running the Manjaro mhwd-kernel tool to update your kernel to a newer version. Updating your system means updating all your isntalled packages. Third, the mhwd-kernel tool not only handles updating your kernel, but also updates any proprietary drivers in use along with Virtual Box kernel drivers. So there's no having to chase down drivers whenever you want to do a kernel update. Once mhwd-kernel is run to update your kernel, you can either do a manual update on the drivers in use, or a simple reboot automatically recompiles all drivers need by the new kernel. Just a few things that are totally missed not only by you but most reviewers when it comes to Manjaro. Thank you for your comments. I don't mean to offend, but you sound like a developer or volunteer for Manjaro. If that is the case, then I'd love to interview you for a future blog post. As to missing the boat, you didn't actually counter any of my user points. The only thing you say I am wrong about is the idea that a user can always use it without having to update. I write from a user-experience perspective, and as such, your comments show how much there is to progress when it comes to the user experience for Manjaro. Most users aren't going to know how to run the mhwd-kernel tool. Actually, I doubt any non-Linux people would know how to do that. My dad would give up on computers before learning how to do that. Manjaro is not Linux for the masses, and that is what I'm wanting to find. Anyway, let me know if you have a vested interest in the distro as I'd love to have an interview. And I've dusted off an older laptop for use in testing. You've got a great point. VirtualBox only goes so far. Thanks for the tip! I'm neither a developer or a volunteer. Other than I've been running it since 0.8.6 which is only one revision back from your review. So I'm a recent convert as well as an enthusiast I guess you could say. I'm sorry if I came off sounding like your review didn't do it justice. Overall your review is spot on as far as ram usage, and usability out of the box. As far as aesthetics that is always subjective but (imo) you are right in that the xfce version is the prettiest which makes sense, since it and openbox are the devs vision of what Manjaro should be. I wouldn't have a problem recommending Manjaro to my Dad at all. In fact I actually did do that 2 days ago, but like most of the older generation he declined the offer since it would getting used to new habits. If your interested in an interview with one of the arch devs I would just sign up for the Manjaro forums. The devs are there alot, and give not only advice and help, but also let the community vote and have input into the direction Manjaro is taking. I do think the Manjaro team could do better in their marketing/advertising for the features that make Manjaro different from other Arch derivatives. The mhwd-kernel tool is just one of the things they've done that no one seems to talk about or know about it, unless they've actually run it. It's in the wiki, but without some searching you don't even know it's there. Good luck on your install, and for what it's worth, I prefer the 0.8.6 version to the 0.8.7 version (not a whisker menu fan). You can install the older version, then do a sudo pacman -Syu and have all the latest updates but with the older xfce menu, and planky already configured out of the box. Then if you want to update your kernel of course use the mhwd-kernel tool for that. As of tonight I'm running the 3.11.01 rc7 release of the linux kernel on the 0.8.6 release of Manjaro. I am a little surprised that the distro is using so little ram. Linux, by design, should be using a lot of ram. See the following article: http://www.linuxatemyram.com/. Really enjoyed your post. Thank you for commenting! Balanced and thoughtful review. Thanks. I am going to try Majaro today! I think I will go your route and choose Xfce, because my rig has just a weak AMD E-350 cpu even though it does have 4 gigs of RAM. i recently bought a new ultrabook with windows 8 installed. i want to throw 8 away and use a linux distro. sadly, i am too old to want to learn how to use a command line. would you recommend manjaro for me? @Igor: I hope it works out for you. Please comment after you've tried it out. I'm curious about your results. @Anon: I personally would not recommend Linux at all if you just bought a new Ultrabook. The reason I say that is because you seem hesitant to learn a new system. I would also be concerned about voiding the warranty should something go wrong while you're tinkering around. It's not that I like Windows better than Linux, it's that I think the warranty is awful important. Having said that, I enjoyed this distro a lot! If you were going to try Linux, this would be one of the ones that I would recommend. I have been watching this distribution since it came out 2 years ago. Each release brings more improvements! This has not even reached version 1.0 and it succeeds where other distributions fail to deliver on their promises. As a former Arch user, I was worried that updates might break my system, so I ran extensive testing of Manjaro in virtualbox for several months. After seeing nothing but smooth performance I knew I could use this as my main OS. Manjaro truly delivers on the best possible user experience for a rolling release model. I never had an update break my system. It is not necessary for users to open a terminal unless they need the Manjaro hardware detection tool (MHWD) to install drivers or upgrade the kernel. The wiki is well written. The Manjaro community is very friendly and helpful. you will not get an "elitist" attitude there. I am confident that by the time Manjaro reaches version 1.0, it will be a flagship Linux distribution beginners will be able to make good use of while still empowering seasoned Linux veterans. Wrt the memory usage from what I understand you reviewed the livecd and not and actual install of Manjaro. If this is the case then yes you will see high memory usage with the livecd but it will be less when installed. When you boot from the livecd/image memory usage is much higher than that of a normal install. Since you like Manjaro so well, you should give Antergos a spin; http://antergos.org.